Pierate - Pie Reviews: Do too many Cooks spoil the pie? Do too many Cooks spoil the pie? It’s the age old saying...if you can’t stand the heat, get out of the kitchen. No, wait. Too many cooks spoil the broth. Yeah, that’s the one. Though seeing as I’m not an eater of broth, I thought I’d see whether the saying applied to pies too. And what better way to test this out than to visit Cooks of Pwllheli in North Wales. Cooks takeaway are a local firm, looking to corner the niche market of luxury pie production in takeaway form, located in the far north-west corner of Wales. 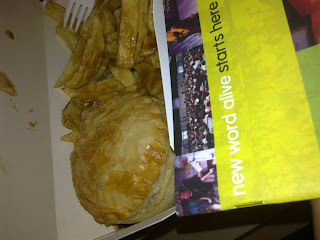 The standard of their fish, chips and – most importantly – pies immediately caught my eye. So the question was, would Cooks spoil the pie? Or would I have got a real catch? So the first thing to notice with this pie is that the pastry on this pie is flaky and delightful almost to the extreme! There is almost too much flaky goodness as you cut through the pie, making you wonder if they actually remembered to put the content of the pie in there at all! But rest assured, when I dug down through the pastry lid to the content, what I found were lovely, tender pieces of Steak and a not too much Kidney to compliment the pastry and rest of the pie perfectly. As a side point, the chips there are very nice too, and you can clearly see the chunks of steak and gravy oozing out of this pie (always a good sign). 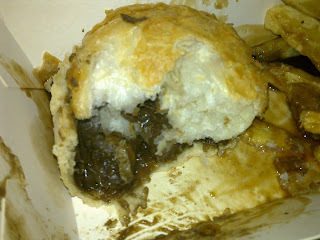 I would certainly commend the cook at Cooks for their fine effort in producing a great, if slightly pricey, takeaway pie. I certainly wouldn’t be able to have too many Cooks pies, that’s for sure! And a great way to end the New Word Alive conference too! Land of Hoop and Glory? Are you Haven a laugh?! The perfect marriage of beef and brandy? 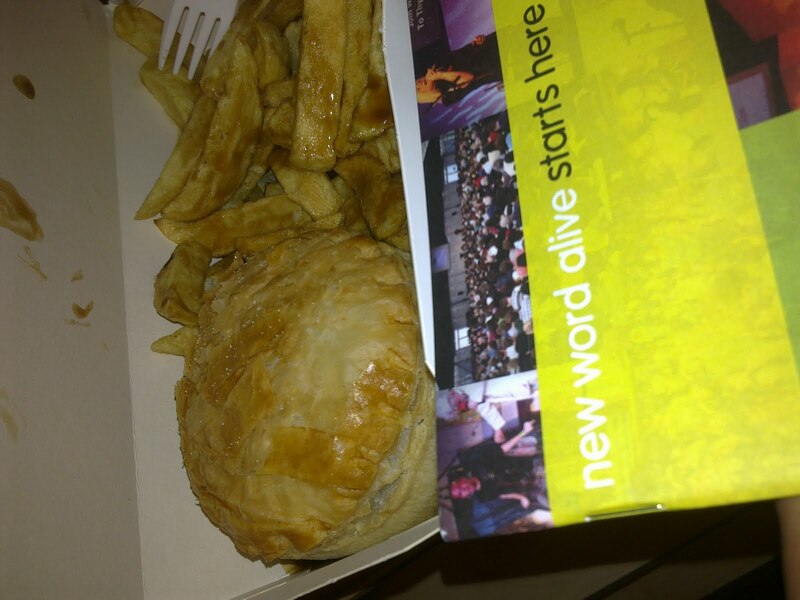 British Pie Week hits the National Indoor Arena!